We love the fact that it is important to our team that Wolverine contributes to our community in meaningful ways. We are fortunate to be headquartered in a great community and recognize the contributions our community has played in our longstanding success. It is a privilege to be able to share the joy of giving back with our team, as we share the resources we have to help make our community a better place for all. We are committed to providing our team members with opportunities to serve our community. This may include anything from volunteering at MiCareerQuest to participating in a Habitat for Humanity Build. We love seeing our team members volunteer their time as much as they appreciate the opportunity to give back. We are committed to annually giving back to our community through our team’s talents. It is a privileged and honor to be able to provide safe and reliable construction services to organizations in need. Our hope is that our assistance will allow our non-profit community partners to be able to focus their time and resources towards helping the populations they serve instead of worrying about expenses related to small construction needs or repairs. We understand the importance of financially supporting the great work and programs that are helping our community be a better place for all. We want to support our team members by supporting those causes that are important to them. We offer this support through our Wolverine Impact Matching Donation Program. 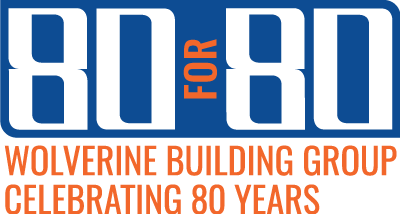 This year Wolverine Building Group turns 80 years old. We couldn’t have reached this milestone without our dedicated team and the great support of the communities in which our team members live and work. A theme that lives not only in our Strategic Direction but also in our Core Values is that “we hope to share generously with the people and places we touch.” This is just a small way to share our success by supporting those causes and organizations that our team members are passionate about in the community. We hope that this year, in honor and recognition of celebrating 80 years, our team will make a total of 80 personal donations that we will match dollar for dollar. Wolverine Building Group and Habitat for Humanity of Kent County – two great organizations working together!